Coatesville native Kenya Woodall ran for the University of Cincinnati at the NCAA Track Championships last week. Above, she’s seen in competition for the Bearcats earlier this season. Photo courtesy University of Cincinninati Athletic Department. Kenya Woodall, the former Coatesville Area High School track and field star, is continuing her outstanding collegiate career at the University of Cincinnati. Last week, Woodall narrowly missed garnering All American status last Thursday at the prestigious NCAA Championships in Eugene, OR. 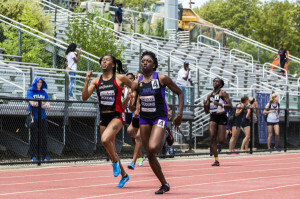 She ran the 400 meter and came in fifth in her heat, with a time of 53.43, which was just one hundredth of a second from earning Second Team All American status. While watching her run on ESPN, the commentators stated how the wind was really strong against the runners on the back stretch, and Kenya confirmed that she knew that hurt her time. Woodall acknowledged in an interview that she had hoped to beat her personal best, a UC school record of 51.78, in the race, which she ran at the American Athletic Conference Championships, held at UConn, between this past May 14-17th . “I am very excited [about running in the NCAA Championships as she]….had never run in Eugene, OR,” she said. When asked about her Eugene, Oregon experience, she said she was thrilled to compete in one of the United State’s acknowledged track Meccas. Woodall further informed me that Eugene, OR is the original home of NIKE, Inc, which was started by an Oregon graduate in 1964. She cherished the opportunity, as one of only four male and female teammates to represent the university. The junior standout remains a workhorse for the Cincinnati Bearcats, as she runs the individual 100, 200, and the 400 meter runs, as well as possibly the 4 X 100, and 4 X 400 relays, at any given competition. This work ethic paid off when she won the 100 and the 400 meter at the 2012 PIAA State Championships, leading the Lady Red Raiders, to their first overall AAA championship. 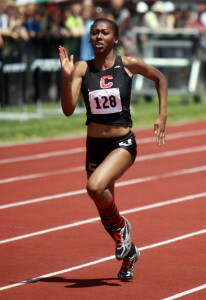 Woodall in her Coatesville Area High School days, competing in the Pennsylvania State championships in 2012. Times File Photo. Woodall is looking to graduate in May 2016, while majoring in Criminal Justice and gaining a certificate in Substance Abuse Counseling. She plans to continue her offseason training at Coatesville High School which, she notes has always been so gracious to her using the facilities for weight training and its outdoor track during the summer before returning back to the university in late August. One of her goals, she said, is to obtain All American status in 2015-16, while improving her personal best times. Besides the 400 meter record, Woodall finished out her junior campaign breaking the school indoor records, with a 400 m with 53.73 and anchoring the 4 X 400 in 3:43.35. She also now holds the second fastest outdoor 100 meter in school history with 11.56, which she accomplished earlier this year. She earned five All AAC honors, along with coming in second in the College Women’s Championship 100 m (11.62) at the Penn Relays this year in Philadelphia. 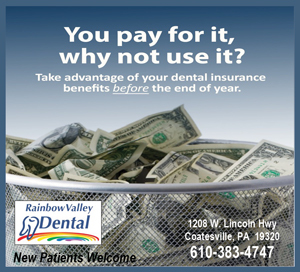 Her parents are Kenneth and Karen Woodall, and they are all very supportive and happy about the accomplishments of the daughter, and the very fine person she has become, as one of Coatesville’s overall elite athletes. We all to need to continue provide nothing but well wishes for her continued success.